The recent story about the bogus, clandestine, unrecognized, and completely irregular "Masonic Police Department" that played itself out yesterday brings up a related point. I think there's something useful in putting an explanatory page on our grand lodge websites about what regularity and recognition mean Masonically. 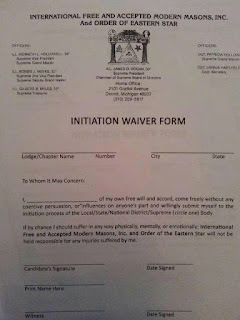 Those who join lodges under the jurisdictions that are considered irregular and unrecognized by the principal grand lodge in a state (or country) will not be allowed to visit and interact with the overwhelming majority of the Masonic world, outside of their own isolated group. That's just truth in advertising, and people should understand what they are joining, and what they are not. It doesn't do any of us any good to pretend other grand lodges aren't at work in our states. Anyone seeking membership in our jurisdictions by looking online is bound to run into other lodges or grand lodges that don't fit the mold of what we teach. (When I tell most American Masons that almost 20% of the Freemasons in France are women, they look at me like the dog talked.) We might as well acknowledge their existence and explain the difference. Unfortunately, people tend to join organizations that their friends, family or co-workers do, and bogus groups are somewhat self-perpetuating. They are fueled by new public awareness of Freemasonry from media sources, and the interest is growing. Opportunists see a chance to cash in on an ancient fraternity's history and reputation, and thus the problem continues. Regularity and recognition are issues that make outsiders' eyes glaze over, but I think ALL regular and overwhelmingly recognized grand lodges need to address the issue on their public material. It would help to put a stop to - or at least slow down - the practice, and guide potential new members to the more widely welcoming world of Masonry. Wouldn't their recognition of racist and anti gay grand lodges make irregular the supposedly regular grand lodges. Alleged autonomy of grand lodges is a flimsy fig leaf. Recognition of lodges that discriminate is just a degree (no pun) from the moral and ethical irregularity of the southern grand lodges. Paul, not all southern Grand Lodges exclude predominately African American Masonic bodies because of racism. I admit that may be true but to a degree. For instance, the Grand Lodge of Louisiana has fought throughout its entire existence to maintain authority over the symbolic lodges in their state. Their territory has been invaded by a Consistory, a Supreme Council, multiple Grand Lodges etc. Not just the instance of territorial invasion but also the invasion of lodges subordinate to her. I completely understand (because I know their entire history), the reasons that the Grand Lodge of Louisiana (speaking only in reference to them) does not recognized any organization claiming to be masonic in the state of Louisiana. Also, The Grand Lodge of Louisiana has extended mutual recognition to the Prince Hall Grand Lodge several times in the past ten years, including last year as well. Every time, the Grand Master of the Prince Hall Grand Lodge has declined. I would appreciate it if you told the entire truth with all of the facts BEFORE you speak so negatively of "Southern Grand Lodges." Brother Aaron,the number of African American masons from the northern states turned away when trying to visit, some of them uniformed military,is a dark stain on the southern lodges. i have actually seen this year an officer crying when he described his treatment. We do indeed speak negatively of southern masonry. The last lair of the racists and gay bashers, where the rednecks fled when they lost exclusive use of the water fountains and libraries. Clubhouses for bigots. The exceptions are feeble. Paul Rich...I'm a bit disturbed by how you would blanket statement brethren as red necks and gay bashers. I, originally from Massachusetts was a member of John Greenleaf Whittier Chapter of DeMolay and am a proud member of the AF&AM Blue Lodge here in Texas. There are many veteran brethren active in the blue lodges, Scottish and York rite appendage bodies. Remember your obligation before you speak poorly of your brethren, especially on a public forum representing the fraternity. And if you take an issue with anything I have said you can feel free to personally message and try me. Have a wonderful day brethren. Paul, its very disheartening to hear you make blanket statements about brethren using the terms, "rednecks, gay bashers, bigots" . you see, I was born in Massachusetts... Belonged to John Greenleaf Whittier chapter of DeMolay in my youth and proudly belong to the AF&AM Kelley Blue Lodge here in San Antonio Texas. I find it utterly insulting about veteran comments seeing over half of our Lodge is actively filled by veteran brethren. Some having injuries seen and unseen, still treated with dignity as all brethren should be. You say "dark stain" but I can assure you , such is not the case and I would remind you of your OBLIGATION concerning your wording and poor descriptions of the brethren and the fraternity. That is conduct unbecoming and if I've offended you, that's unfortunate but your comments need to be brought to light and addressed. However, if you feel the need to try me you are more than welcome to message me personally and I will be more than happy to extend the courtesy of fellowship towards a brother. We can say "yea I know women are in lodges over in Europe" but that doesn't mean we deal with them if they aren't recognized by our jurisdiction. Some dogs ride skateboards, don't care about that either. I don't think you understood what I was suggesting. I'm simply saying that we do as UGLE did, which is to say essentially, yes, we know feminine Freemasonry is at work in our jurisdiction, and they are in all other ways regular, except that they admit women, which makes them ineligible for recognition by the overwhelming majority of masonry worldwide. Then, when women come to them seeking membership, they happily point them down the road to the two female GLs in London, instead of being asses and telling them to buzz off, no gurlz allowed here. Hadn't seen updated figures in a while, but i didn't know that female membership had increased that much under the GOdF lodges. That's on top of the existing feminine and Co-Masonic GLs already at work for many, many years. I find it hypocritical for mainstream to "throw a rock and hide their hand". On the topic of regularity and recognition. The ignorance and arrogance of mainstream will only perpetuate the rise in independent grand lodges. For the record, there are some Independent GL that are completely bogus. For the most part because of the ignorance of not wanting to associate with anyone outside of their jurisdiction that might be different only causes suspicion on the ones that may be operating in due form. Although you may question the origin don't demonize a community of people that might have found what was lost......true brotherhood. Asé! One of the principal points of regular, recognized Masonry is the ability to travel and be welcomed within a worldwide brotherhood. This is how Masonry spread throughout the globe in a relatively brief time. Joining an "independent" lodge denies you that privilege. I suspect such lodges do not properly explain the situation, but perhaps they do, and maybe even revel in their isolation as some sort of "secret society within the fraternity" or some such nonsense. No one can copyright a square and compass symbol, unfortunately. There used to be state laws across the US forbidding organizations from claiming to be Masonic when they had no authority to do so, and there were civil penalties for doing it. Those laws have largely been struck down over the years, unfortunately, and so bogus lodges continue to proliferate. Adolf, if you are happy within your isolated group, knock yourself out. Practice your Freemasonry any way you see fit and be happy. I'm simply suggesting that new men be more adequately warned about the pitfalls of joining such lodges on our GL websites. The more extreme hazard, while we are splitting hairs on "regularity", is the Grand Lodges that don't exist outside of cyberspace. These real masonic con-men are in a different league from the Compact and the Grand Orients. My own research found Google Street View invaluable, as the address given was frequently a parking lot, building site, or a lock-up obviously unrelated to any masonic activity. If we're pointing fingers, these should be the priority. An interesting side note is that the first Phylaxis Society "Bogus" list was originally compiled before easy internet searches were available. It was good, old fashioned research, done in city directories and state tax record files. They uncovered hundreds of these groups, at a time when it was much harder to accomplish. And they did it in every state. Incredible. The most recent widespread bogus internet-only group was Brad Cofield's "1613 Nation" hoax. 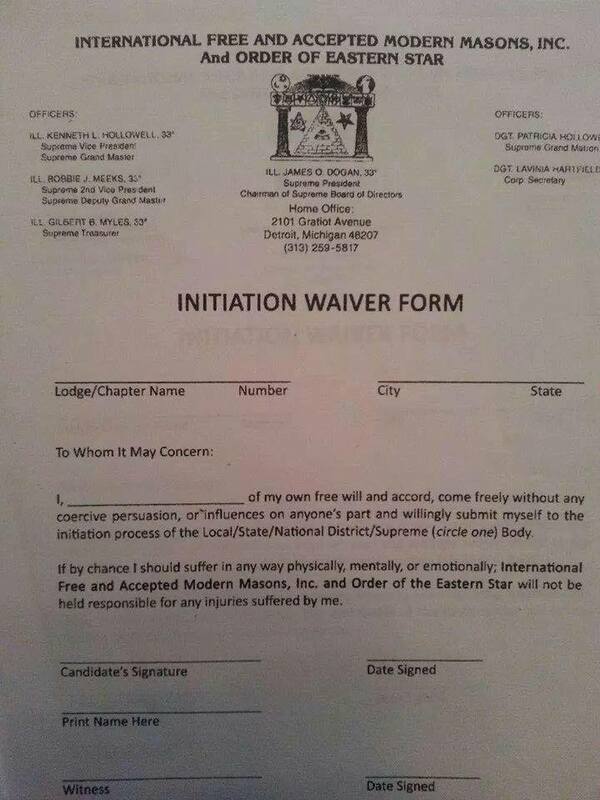 And a newer version is the "Virtual Grand Lodge"
I believe there should be Fraud Charges should be bought against the Fake Grand Lodges they are misleading and selling Fake Degrees and which Individuals actually think that are Real Masons.I believe that Grand Lodges needs to address this Cancer because it's spreading out of control. There are many men that have showed interest in masonry without knowing the difference between a "bogus" mason and a "regular" mason. Men seek brotherhood out some good pretenses and some bad. People are visual, they may see flashy jackets or they may see brothers working in a food pantry. I agree that there are some bodus lodges that hurt members out there financially and physically. But there are some that are truly doing the work of the craft and are unfairly grouped in with bogus groups. It is fair to assume that the world has gone to a very dark place to where name calling is the new thing to call a group of men in some case are doing GOD'S work but for the lack of communication are demonized by the masses. Progression cannot be made if we are separate forever. I find it relevant to note that the Antients were "irregular" to the Moderns, and vice versa, until with the equivalent of a stroke of the pen, there was UGLE and everybody therein was "regular". It would be fair, also to raise the question of who conferred on the "four old Lodges" the power to raise a Grand Lodge, when such could hardly be considered anything less than an "innovation in the body of Masonry". I have always chosen to reflect on the conduct of someone who gave indications of belonging to a Lodge, and regulate my conduct towards him accordingly. He may have been a member of a "perfectly regular" and recognized Lodge, but if he acted against Masonic principles I consider him a cowan on Masonic clothing. And I hold the opposite to be equally true and valid. If a man has been made a Mason in his heart, he is a brother. I find it interesting that you and others in F&am and pha feel that we who are not in your bubble can't travel or visit. You see the point that you all miss is that we can travel outside of our jurisdiction and so what we can't visit an f&am or pha but we who are outside of your bubble travel with others who are outside of your narrow myopic bubble. I would be in what you all would consider an irregular lodge. At first, I was somewhat upset that I could not visit with the "overwhelming number" of Lodges. Then I considered the work that we do in our community and the Brotherhood and Sisterhood present in our Lodges and OES Chapters. You can have your recognition. Continue your characterizations of "bogus" and "fake". For an organization that is about light, all I hear is elitism and a snobbery. I'll ignore for the moment the notion that being a Freemason does not carry along with it a certain reputation of elitism. I will simply hope that you would agree that a group of people brandishing themselves as a "Masonic Police Force" to the general public is stretching even the fringiest bounds of what anyone would regard as Masonic behavior and wanders into the realm of fakery. If you like your lodge, find fulfillment in its mission and accomplishments, and have made longstanding friendships in it as a result, then by all means, enjoy yourself. As long as it was made clear before you joined that you have a limited circle of specifically Masonic associations. My name is Scott McGregor and I am the WM of Elliot Lodge #38 in Fayetteville, NC.